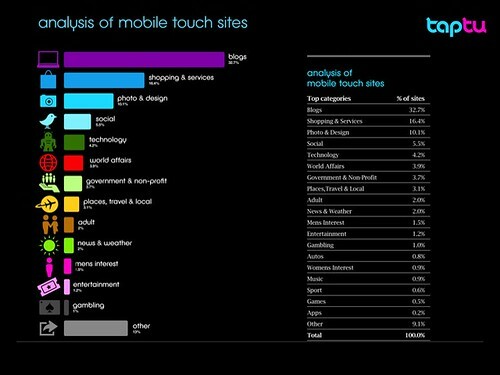 We are pleased to release the third edition in our series of reports analyzing the Mobile Touch Web.’a0 Our January Report, examined the Touch ecosystem as a whole and described the rapidly growing segment of touch friendly Web sites.’a0 The February Report focused on shopping and services, a major subset of the touch friendly Web. In our latest report, we take a look at another fascinating segment of the Mobile’a0 Touch Web: the Government and Non-Profit sector.’a0 Due to limited resources this sector is usually more conservative when it comes to adopting new technologies. However, Taptu have observed that this segment is adopting the Mobile Touch Web with vigor! The report highlights some of the leading services from Education institutions such as MIT, the Haiti disaster relief effort from the Charity sector and various local and federal government agencies that are using the Touch Web to reach a mass audience. 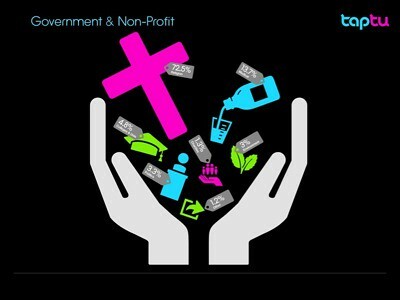 We were also surprised to see a large number of religious organizations embracing the Mobile Touch Web -‘a0 72 % of all sites in the Government & Non-Profit segment are faith-based services. As mobile developers know all too well, creating an app for each platform can be time intensive and expensive.’a0 However, creating content for the Mobile Touch Web can be a great equalizer. You can download today’92s report as well as sign up to receive future reports hot-off-the-press by visiting Taptu.com/metrics.’a0 And for those of you who are new to the Mobile Touch Web we posted an overview on Slideshare which provides a great introduction and context to this new mobile ecosystem.